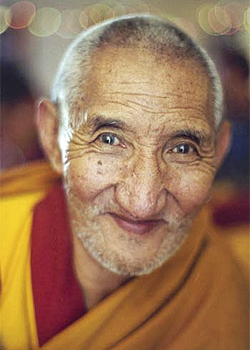 Ribur Rinpoche was born in Kham, Eastern Tibet, in 1923. He was recognized at the age of five as the sixth incarnation of Lama Kunga Osel, a great yogi, scholar and teacher. He was an accomplished practitioner, as well as a writer and teacher who taught in numerous countries around the world. He lived in northern California for many years before returning to India, where he passed away in 2006. 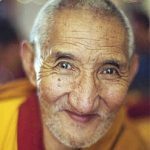 For a longer biography, see the preface of the book How to Generate Bodhicitta, and read about his reincarnation in this FPMT biography.